Karachi Kings fans are set for a huge shock as star all-rounder Shahid Afridi will not be part of their team in the fourth season of Pakistan Super League starting February next year. 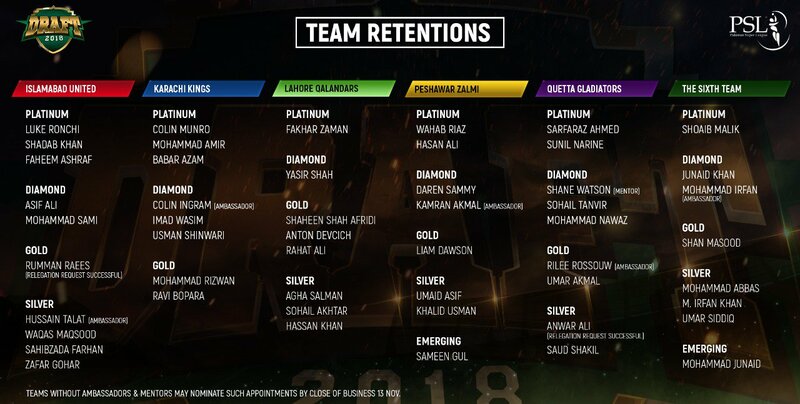 This was revealed when PSL teams’ player retention list was released on Tuesday. Kings have retained left-arm pacer Mohammad Amir, right-handed batsman Babar Azam and Black Caps opening batsman Colin Munro as their Platinum picks and South African all-rounder Colin Ingram moving to Diamond as a player ambassador. The retention was an easy call for the defending champions Islamabad United after Misbah decided to not take part in PSL 4 as a player; he will be with the United as a mentor. They have retained Luke Ronchi, Shadab Khan, and Faheem Ashraf – all three are their platinum picks. Peshawar Zalmi have maintained their pace pair of Wahab Riaz and Hassan Ali in their Platinum category; and after Hafeez’s departure, Zalmi will use their Platinum pick to sign their foreign player in the drafts. Seasoned wicketkeeper-batsman Kamran Akmal has been put into Diamond category as a player ambassador. For Quetta Gladiators, Australian all-rounder Shane Watson has moved to Diamond roster as a player mentor. They have traded their Platinum pick with Lahore Qalandars against Caribbean all-rounder Sunil Narine in a blockbuster trade deal. Lahore Qalandars, who have now earned the first pick in the draft, have retained hard-hitting opening batsman Fakhar Zaman as their only Platinum player while leg-spinner Yasir Shah was retained in Diamond category.